School was nothing but a taboo for me’ concludes Johannah, a young South African, after recounting her life story. Johannah is one of the early school leavers who features in this book. Figures on participation in education in Africa show that despite government agreements and policies developed under the banner of Education for All this remains a remote goal. In several countries, programmes on Universal Primary Education have improved access to education, but do those who enter school remain there until they have reached a suitable level? Do they acquire enough competences at primary and secondary school to survive the tough daily life in sub-Saharan countries? What happens to children and young adults who leave school early? What measures can be taken to prevent them from doing so? This book is based on research carried out in Eastern and Southern Africa by scholars from Africa and the Netherlands who cooperated within the framework of the ESLA project. The contributions to this book reflect the exchanges and discussions which took place in this research group, initiated by staff of Mzumbe University in Tanzania, Uganda Martyrs University and the University of Groningen in the Netherlands. The group aims to go beyond figures and uncover the causes, effects and stories of the young people involved, as well as explore promising new strategies with which to address their needs. 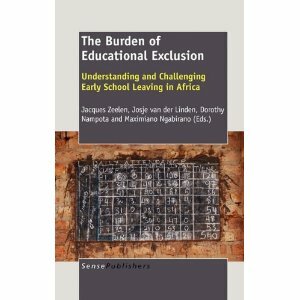 As early school leaving is not exclusively an African problem, a contribution on the Dutch situation is also included.